. (2015, January 31). Updating the Emergency State. Retrieved from http://saisjournal.org/posts/updating-the-emergency-state.
. "Updating the Emergency State." The SAIS Europe Journal of Global Affairs. 31 January 2015. Web. 18 April 2019.
. "Updating the Emergency State." The SAIS Europe Journal of Global Affairs. http://saisjournal.org/posts/updating-the-emergency-state (accessed 18 April 2019). Last month, the Senate Intelligence Committee offered the world an edited but gruesome glimpse at how far Washington and its national security agencies strayed from America’s founding values and traditions, as well as international and domestic law, during the years after the Sept. 11, 2001 terrorist attacks. Repulsive as many of the grisly new details revealed were, they came from a redacted executive summary of a longer and far more detailed classified report detailing the variety of cruel and unusual punishments the Central Intelligence Agency and its contractors inflicted on hundreds of secretly held prisoners, many later discovered to be innocent of any terrorist crimes. Blandly called a “Study of the Central Intelligence Agency’s Detention and Interrogation Program,” the committee report was a catalogue of tortures carried out under the authority of the United States government on detainees in United States custody who had been covertly whisked away to “black” off-off-the-books prison sites around the world. How did this happen in a country whose Constitution explicitly bars inflicting “cruel and unusual punishments” and guarantees all persons “due process of law”? And how can those responsible for these actions not be prosecuted by a country which is a state party to the International Convention Against Torture, the relevant provisions of which have been enacted by Congress as binding domestic law for offenses committed inside and outside the United States”? Dubious legal opinions by Bush administration officials before the fact and exceptions enacted by Congress in the 2006 and 2009 Military Commissions Acts after the fact fail to provide adequate answers. In fact, those White House and congressional actions constitute part of the question we are asking here. Such illegal and unconstitutional practices were not and are not supposed to happen under the authority of the United States of America. But they did happen. Further, similar departures from constitutional standards repeatedly took place even before 9/11 - e.g., undeclared wars from Korea in 1950 to Syria in 2014, internment of hundreds of thousands of Japanese citizens and non-citizens during World War II, etc. And such violations of our laws in values by our elected leaders will almost surely happen again in the future; that is unless or until the American government and people insist on a return to constitutional norms, consistent adherence to the rule of law, greater transparency in government decision-making and accountability for those who knowingly set aside the law and the Constitution to commit patently illegal acts in the name of national security. The Obama administration’s refusal to prosecute those implicated in the unlawful activities under the CIA’s Detention and Interrogation Program, including those ranking officials who ordered or authorized it, is a thoroughly discouraging sign. The crimes may have been committed under George W. Bush, but the cover-up, or at least the refusal to prosecute, is taking place right now under Barack Obama. The Emergency State, as ever, remains a bipartisan project. Consider the message this refusal to prosecute sends to future national security operatives trying to balance political pressure for results with moral and legal scruples about resorting to illegal methods. As things now stand, that message seems to be “go ahead and do it”. Lack of results may turn out badly for your career, but “taking the gloves off” and operating on the “dark side” likely will not. Such signaling will shape the conduct not only of future interrogators, but also of their political and bureaucratic bosses tempted to give such orders. The same kind of signal, unfortunately, is sent by polls taken after the release of the Senate Intelligence Committee’s report that show most Americans now think torture can be justified. Neither the American government nor the American people now seem to be demanding a return to America’s lawful and constitutional traditions. That makes it all too likely that this sorry chapter of American misconduct, with all the damage it has done to our democracy at home and our reputation abroad, will be repeated. In my book, The Emergency State, I describe and analyze what is now a 75-year-long history of constitutional short cuts and evasions taken in the name of national security that have incrementally endowed the United States with a kind of parallel national security constitution. It periodically reverts to this alternative playbook when the requirements of the real Constitution seem too cumbersome, too politically perilous or too difficult to explain to the public. Since the end of the Cold War and its attendant thermonuclear perils, these shortcuts have rarely been justified by any operational need to act faster than the Constitution allows. Think about the 18-month lead up to the 2003 invasion of Iraq or all the agonizing back and forth media discussion about bombing Libya, Syria and Iraq. Even the retaliatory attack against Afghanistan after 9/11 had an almost one-month lead-time, plenty of time for doing things the constitutional way, as the United States had done in a much shorter space of time after Pearl Harbor. Presidents ignore the Constitution’s requirements because they can, and they can because voters and legislators let them get away with it. And when they are challenged, they cite Emergency State shortcuts taken by their predecessors, and the negligent passivity of past congresses, as if those were constitutionally justifying precedents. This Emergency State alternative rulebook has now come to apply not only to national security questions, but to wider areas of our national and international life. One example is Congress’s habitual readiness to delegate much of its constitutional authority over international commerce to the executive under so-called fast track authority. This unfortunately allows presidents to shape the trade, investment and intellectual property regimes that now govern so much our economic lives behind closed doors with minimal democratic transparency and oversight. With so many important decisions about war, peace and the ground rules for globalization essentially taken off the table for open political debate, it is little wonder so many Americans feel alienated from their politicians and distrustful of Washington looking out for its own. 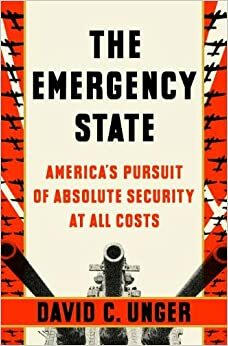 The main thesis of the Emergency State is that the politics of national security, especially during the Cold War decades, contributed to an expansion of executive powers, including a much expanded power to keep government actions veiled in secrecy. That makes it almost impossible for ordinary citizens, and even most of Congress, to know what our government is really doing and to hold it democratically accountable. The way national security policy has developed under the Emergency State pushed aside the separation of powers and the democratic accountability that the framers of the U.S. Constitution counted on to preserve the republican and democratic achievements of the American Revolution. The original rationale for the national security state was fear. U.S. foreign policymakers of the 1940’s and early 1950’s, men like Dean Acheson, James Forrestal, Paul Nitze and John Foster Dulles, sincerely believed that expansionist Stalinist Communism posed an existential threat to America’s freedom, prosperity and survival. With the benefit of hindsight and archives, we now know that a great deal of misreading of Soviet capabilities and intentions and some fevered worst case hypothesizing underlay these views. But honestly believing what they then believed, these influential policy shapers of the early Cold War felt their responsibility was to protect Americans from this existential threat, even if that meant adopting some of the other side’s tactics and jettisoning some of America’s constitutional scruples. And that is exactly what some of them, in policy papers such as NSC 68 of 1950, said was required. The minority that thought otherwise left, or was driven out, of government during the Truman and Eisenhower years. That dominant mindset explains the early Cold War Emergency State. And given what we know about bureaucratic inertia it may even go some way to explaining later Cold War versions. But that can only take us up to 1991, after which there was no more Soviet Union and “Red China” had become a strategic ally and economic partner of the United States. If we can understand why the United States did not return to its pre-Cold War constitutional ways after 1991 and why the Truman administration’s visions of anti-Soviet “containment” seemed to glide seamlessly into new theories of “enlargement” that did not even require a super-power enemy to keep the zero sum geopolitical game going, we can better understand why Barack Obama has become America’s 13th consecutive Emergency State president. Bureaucratic inertia may provide some of the answer. Has Obama reshaped the CIA, or has the CIA reshaped Obama? Are long habits of cold war thinking and political discourse drawing the U.S. into a needless zero sum battle with Russia in places like Ukraine, Georgia or Moldova? Are those same habits threatening to turn the promised pivot to the Pacific into a new containment dynamic with China? The perennial potency of fear as a force in American domestic policy, and its corollary, politicians’ perennial fear of being accused of weakness on national security, something my SAIS colleague Professor John Harper has described as an “iron law” of American politics, may also be operative here. (Such reflexive political pressures seemed to push Obama out of his original resolve to steer clear of Syria’s messy civil war). Another factor may be the longstanding article of faith among U.S. policymakers that a globalized Open Door to American trade and investment is essential to America’s prosperity and even survival. That deeply rooted view preceded Woodrow Wilson’s liberal internationalism, the Cold War and the war on terror and continues to motivate constitutional short-cuts like fast-track today. There should be no such contradiction. The right to habeas corpus should “not be suspended” (Article I, Section 9) “Freedom of speech, or of the press” should not be abridged nor “the right to peaceably assemble” be interfered with (First Amendment). Telephone and Internet data and other personal “effects’ should not be subject to “unreasonable” or unwarranted searches (Fourth Amendment). Persons (not just U.S. citizens) should not be “deprived of life, liberty or property without due process of law” (Fifth Amendment). “Cruel and unusual punishments” should not be inflicted. These Constitutional guarantees had been ignored, sidestepped or defied by the George W. Bush administration, as candidate Barack Obama rightly complained. And they continued to be ignored, sidestepped or defied by the Obama administration, even during its first two years when it could call on strong Democratic majorities in both houses of Congress. The contradiction remains to this day between the Obama administration’s policies for “keeping America safe and secure” and the commonly understood requirements of the U.S. Constitution. This contradiction undermines not just the civil and political rights of Americans and foreign nationals under U.S. custody or jurisdiction. It also undermines the Constitution’s careful and delicate balancing of the respective war powers of the executive and legislative branches. This imbalance has been the norm since the Truman Administration, and it is still the norm under the Obama administration. Only after the 2010 election can Republican congressional resistance be invoked to explain why Obama did not do more to deliver transformational changes. Before that, we have to look at Obama’s own choices – his ruling out in advance any punishment of those responsible for possible criminal offenses like those detailed in the torture report, his decision not to rein in NSA spying on the phone calls and Internet messages of ordinary Americans, his expansion of the assassination by drone program from known targets believed directly connected to terrorism to signature strikes (aimed at those who fit a statistical profile, or are in the wrong place at the wrong time). A president who believed that “there should be no contradiction between keeping America safe and secure and respecting our Constitution” would not have behaved that way. After the 2010 mid-term elections, Obama’s defenders can point to unyielding Republican opposition and legislative gridlock. But the Constitution was not written to apply only when the president and the Congress agree on basic policy issues. In that case there would be little need for checks and balances or separation of powers. It is political difference that puts our constitutional system to the test, and unfortunately, it has been increasingly failing that test since the end of World War II. It is not that nothing changed after January 2009. On his first day in office, Obama issued an executive order to close within a year the detention facility at Guantanamo Bay, Cuba, where “unlawful enemy combatants” are held beyond the normal reach of federal courts. Guantanamo is still open, even though most of the prisoners there have been determined safe to release and the administration has the legal power to send them to countries willing to receive them. But Obama has failed to use his full executive authority to release even all of those prisoners found to be no longer, or never, dangerous. Obama also issued an executive order at the start of his first term revoking the Bush administration order that permitted CIA torture. But an executive order, unlike congressional legislation, leaves the door partly open to future abuses. And some critics argue that loopholes remain for detainees in the custody of the military’s secretive Special Operations command. Obama reformed procedural rules for military commissions, but continued to prosecute cases in these commissions, rather than return to the Constitutional framework of Article III Courts supplemented, where appropriate, by courts martial under the procedural safeguards of the Uniform Code of Military Justice. After Edward Snowden’s revelations of widespread NSA spying on U.S. civilians, Obama announced new, more restrictive guidelines for NSA surveillance, but continued that surveillance outside normal Fourth Amendment and privacy guarantees. Obama’s mandate for change was lost not only, or even primarily, on the national security front during his first two years. Even more important were domestic disappointments like stinting on job creating investments in infrastructure and education, choosing a maddeningly complex and bureaucratic approach to health insurance that sacrificed affordability, universality and user friendliness for the sake of getting industry lobbyists on board and that subordinated overall health care cost reductions to arcane beltway games like CBO budget scoring. That meant pursuing real reductions in private sector costs counted for nothing and being able to estimate (optimistically) out-year neutral impact on the federal budget counted for all. Though these issues had little directly to do with the para-constitutional Emergency State I wrote about, they had much to do with Obama’s failure to sustain the kind of broad popular support that would have been needed to challenge the political and economic power of a military-industrial complex that has been fortifying itself at public expenses at least since the days of Dwight Eisenhower. Maybe that was more than any president could do. Maybe it was more than the American public wanted or would have supported during those first two years of the Obama administration. We may never really know. But that is what it would have taken to start meaningfully rolling back the Emergency State. Despite the widespread public disenchantment with the reigning national security paradigm (Iraq and Afghanistan) and reigning economic paradigm (an under-regulated Wall Street and trade agreements written behind closed doors) that drove the 2008 presidential election, Obama has spent much of the past six years building back those paradigms, to the point where repeat performances in Iraq and on Wall Street, under the next administration, or even under this one, are easy to imagine. Six years into the Obama administration, America’s longest war continues in Afghanistan. America’s combat mission was supposed to end on December 31, 2014, but given recent military and political developments in that country (and in Washington) it is hard to imagine that the “residual” training force of more than 10,000 U.S. troops will not engage in combat. Look what happened in Iraq. The last U.S. combat troops left at the end of 2011. But for the past few months, after Iraq’s American-trained army crumbled in the face of ISIS., U.S. air strikes and training forces have been reintroduced. ISIS’s rapid capture of strategically sensitive territory required a U.S. response. But the one Obama has now chosen looks like a pale shadow of the one that did not work under his predecessor, with U.S. firepower put at the service of a sectarian Shiite government in Baghdad against a Sunni minority population disenfranchised and embittered by the last round of U.S. intervention and its political sequels. In neither case has Obama sought or obtained explicit congressional endorsement for reintroducing U.S. military forces into “hostilities,” as explicitly required by the War Powers Resolution. Obama did invite congressional authorization when he considered air strikes against Syria’s chemical weapons sites in 2013, before a diplomatic solution made that issue moot. Before that happened, Obama was derided across the political spectrum and in the media as dangerously weak for his brief flirtation with constitutional war making. It was not an encouraging precedent. The Emergency State is not simply a product of presidential over-reach. It is a codependent system that many political actors regularly participate in. Nobody who paid close attention to Obama’s 2008 presidential campaign expected him to turn away from the exercise of American military power. His argument then was that the war he considered necessary in Afghanistan had been dangerously under-resourced to pursue an unnecessary war of choice in Iraq. Obama also pledged to pursue Osama bin Laden, if necessary by military actions in Pakistan, without the permission of the Pakistani government. But what many did expect, given the thrust of Obama’s 2008 campaign was a return to waging foreign wars (and domestic national security prosecutions) under the actual constitutional rules, not the bizarrely reinterpreted, rewritten and sometimes unrecognizable versions of the George W. Bush administration. That did not happen. Instead of returning to constitutional norms, Obama’s Justice Department has spun out new legal doctrines through memos that argue (so far as we can tell since many are still classified and others heavily redacted) that presidential Commander-in Chief powers or long ago Congressional authorizations to use military force authorize this president to kill American citizens without due process, to monitor private personal communications of ordinary Americans in secret, and to withhold vital information about public policies from Congress and the public. These policies, on top of six previous decades of Emergency State shortcuts, hobble the constitution’s system of checks and balances and erode basic constitutional rights. And while the Obama administration has been unwilling to prosecute those responsible for torture, a crime under U.S. and international law, it has zealously prosecuted more Americans than any previous administration for various forms of national security whistleblowing, including going to the press when all internal challenges of questioning were blocked. The well-known cases of Chelsea Manning and then Edward Snowden are among the most spectacular. But before that came, the legal harassment of NSA whistleblowers Thomas Drake, William Binney, J. Kirk Wiebe and Edward Loomis, who challenged billions of dollars wasted on a flawed surveillance system and John Kiriakou, a former C.I.A. employee serving a federal prison sentence for disclosing the name of a fellow intelligence agent involved in torture. My point is not that this kind of risky whistleblowing should always be immune from punishment. It is that the Obama administration sends an unmistakable message to present and future members of the intelligence community by giving blanket immunity to torturers while throwing the book at whistleblowers. And while outgoing Attorney General Eric Holder has recently expressed reluctance to jail reporters for doing their jobs, a New York Times national security reporter, James Risen, still faces exactly that prospect. It is of course too early to reach any final judgments on Obama. There are still two years to go in his presidency, and although Obama has shown a recent appetite predilection for pushing the limits of his executive powers, he will still have to deal with likely pushback from a new Republican Senate majority that prominently includes Senator Rand Paul of Kentucky, a constitutional-minded libertarian who may mount a serious presidential campaign. Even when it comes to the past six years, we do not yet know how hard and for how long Obama may have tried to move away from the hyper Emergency State style of his immediate predecessor. We have not yet seen most of the classified internal papers that might let us see what policy options were presented to the president and what he pushed his officials to do. But while there is a lot we do not yet know about process there is much we do know about outcomes, and these suggest that the Emergency State not only remains intact, but has in significant ways been expanded during the past six years. Did President Obama try to end the Emergency State? In my judgment he did not. Could he have succeeded if he tried? Again, in my judgment, probably not. Like most presidents, Obama, has fought tenaciously to hold on and even increase every Emergency State increment to executive power successfully asserted by any of his predecessors, whether or not there is any constitutional mandate for that increment. His successors will most likely do the same unless the voters and/or the Congress insist otherwise. That kind of public pushback occurred, briefly, in the post-Watergate, post-Vietnam years of the 1970s. But it did not last long or produce much lasting change. The Foreign Intelligence Surveillance Act (FISA) was one result of those reforms until George W. Bush’s lawyers invented ways to bypass it and a Democratic controlled congress obliging amended it in 2008. In his final two years, Obama now seems determined to do bold things by executive order, like liberalizing immigration enforcement and normalizing diplomatic relations with Cuba. It is psychologically understandable that Obama wants to do big things before he leaves office. But he is doing them not on the basis of his two solid presidential electoral mandates but in the wake of his biggest electoral repudiation. While this can produce good policy, it weakens rather than strengthens our constitutional system. The bold government by executive order that thrills the left today could be succeeded by equally bold executive orders that thrill the right tomorrow. This is not the way American democracy is supposed to be governed. America is still a constitutional democracy – though no longer a robust or healthy one. And for most of the past six years, as for most of the preceding six decades, the Emergency State has been busily entrenching itself. David C. Unger (born March 5, 1947, Brooklyn, NY, USA) is a former foreign affairs editorial writer for The New York Times (1977 - 2013) and author of the book, The Emergency State. He is currently an Adjunct Professor at Johns Hopkins University, School of Advanced International Studies Europe, at Bologna.